Absorbance data is from the Villermaux-Dushman iodide/iodate competitive reaction and correlates to the efficiency of the mixing. Lower values indicate better mixing. Values below 0.1 indicate excellent mixing. 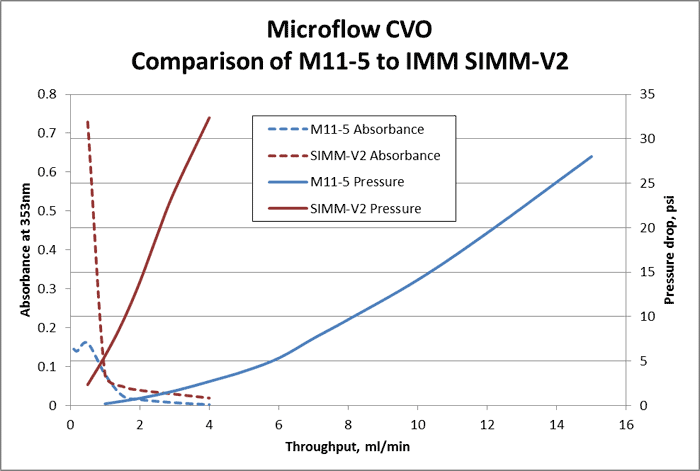 Mixing quality is equal or better at the low end of the usable flow range, but the low pressure drop of the Microflow CVO design allows for use over a flow range 5x that of the IMM mixer.